More iciness, but more epic. 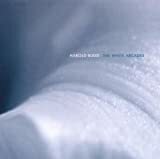 The White Arcades follows the path of coldness established on Lovely Thunder created by shimmering synth textures and airy atmosphere, but here the album's individual pieces work together to create a coherent wordless storyline, almost like a tone poem. Compared to the previous album, the lonely minimalist piano is featured more here and creates an organic center for the arctic ambient sounds to focus around. Needless to say, this album quite high in the category of beauty, which is a usual for Harold Budd. All of the tracks are short-form this time around, maintaining the same compositionally minimalist yet atmospherically dense keys-et-synth style that is familiar to this artist. Unfortunately, while it is beautiful and follows a previously well-used formula, The White Arcades sounds far too close to a rehashing of past ideas. Its a shame that this has to be the case because, as per my tastes, this album has everything that makes an album lovable for me: icy atmosphere, cold textural synth washes, wintery glockenspiel effects, and subtly alternating airy drones that provide a canvas. It's all quite picturesque even, like waking up one morning to discover the ground covered in a thick blanket of snow and icicles hanging from the roofs of the buildings, and the constant progression of the album as a whole can generate an imaginary exploration through this blissful winter wonderland that lay before ye -- but it just doesn't seem fresh. Regardless, though, of this being a slightly altered and reworked rehash of Lovely Thunder, there are a few standout tracks. The winter wonderland type of soundscape that I've described is most easily imagined during relatively upbeat tempo and cheerful yet icy glockenspiel effects of "The Real Dream of Sails", which is a great contrast to the lost-in- the-woods sounds of "Algebra of Darkness". "The Kiss" is smooth, romantic, sensual, piano-based composition that is produced to sound close to the infamous ECM jazz piano sound and is a great closer track and the perfect way to end an album like this. While I do believe this album to be too similar to the wonderful Lovely Thunder, despite the various changes in sound, I'd still say this is a great album and most people into Harold Budd's sound will enjoy this based solely on the familiarity and fans of generally cold atmospheric music should also find enjoyment here. Compared to Lovely Thunder, which I'd describe as being more grey and dark, The White Arcades is more of a pure white. Mostly inspired, partly forgettable, around 75% of 'The White Arcades' is as near to perfect ambience as you could wish for. Once again it took Brian Eno to squeeze out that extra creativity and statuesque sound that is sadly missing from a lot of Harold Budd's purely solo outings. Eno engineered this recording, but his presence is more prominent than that might suggest. This was mostly recorded in Edinburgh of all places - not a city renowned for ambient music by any stretch of the imagination. This was through his connections with 'The Cocteau Twins' of whom he has had a long and fruitful relationship with guitarist Robin Guthrie. Recorded at the ripe old age of 51 'The White Arcades' starts with the best tune on the album - it's self titled and displays a sense of foreboding. Cold and icy, delicately drifting textures punctuated by slightly piercing piano which act as rays of light above the bleak backdrop of foggy electronics. It's not always this good... 'Real Dream of Sails' is a 6 minute piece which has old Harold pottering about aimlessly as droning keyboards flail like sails on a yacht. It doesn't really lead anywhere and sounds improvised. He always sounds best when using huge delay on his piano. This he does on 'the Algebra of Darkness'. This could easily have appeared on it's predecessor 'Lovely Thunder' which is a bit darker than 'The White Arcades'. It does drag on a bit though. 'Totems of the Red Sleeved Warrior' enters the realms of miserableness but is all the better for it as floating long drawn out keyboard chords leave you contemplating beautiful thoughts or reminding you of the last funeral you attended. Eno is at large on this piece. The boring track 'Room' is followed by the majestic 'Coyote' as that piercing Erik Satie piano takes centre stage. And the lovely outro 'The Kiss' sees things off to a nice conclusion with a pretty tune played yet again on piano as soft keyboards wash quietly in the background. For old times sake I'm giving this 4 stars. It was one of the first ever cd's I bought in 1988 whilst still a sniveling art college student. It cost me big bucks back then and to this day it still sounds fresh and bright. 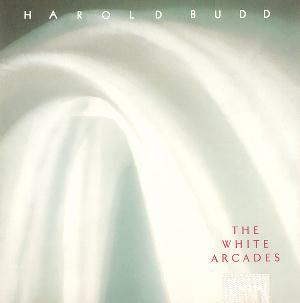 Post a review of HAROLD BUDD "The White Arcades"